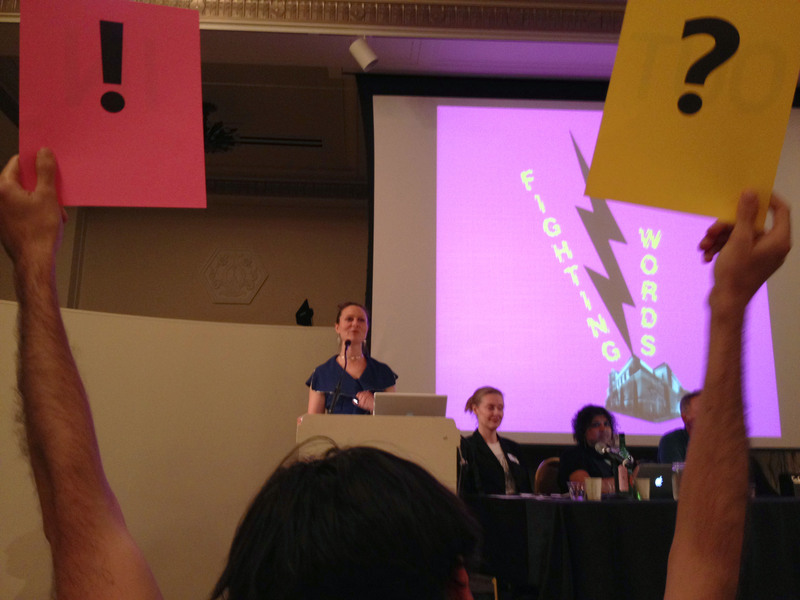 Fighting Words: A public debate on the relationship between social practice and art institutions. 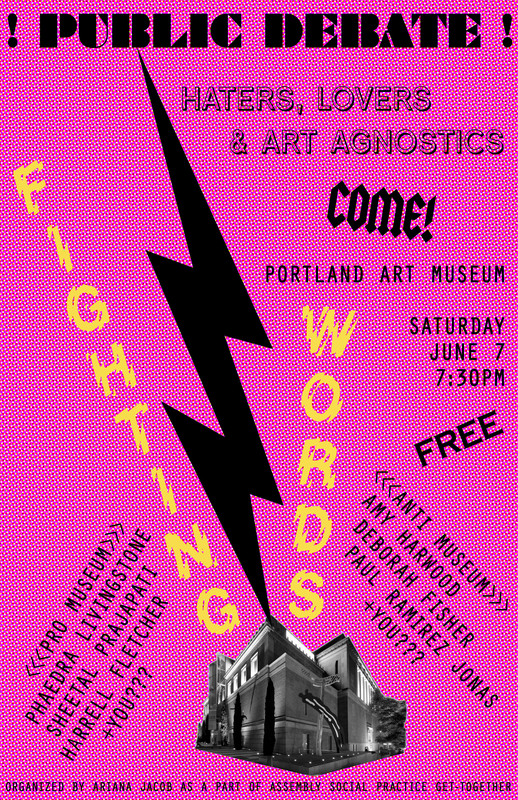 During the summer of 2014 a rousing, free, public debate took place at the Portland Art Museum as part of a gathering of artists, students, educators and arts administrators called Assembly: A Social Practice Get-together. The debate was organized by Ariana Jacob, who invited the six members of the debate teams, as well as the gathered audience, to respond to the question: Does social practice belong in art museums? This question was chosen not because there is a pressing need to resolve that matter one way or another, but as a prompt that could push to the surface the power dynamics of the overlapping and oppositional interests at play in this still forming field of art practice. On the team advocating that social practice belongs IN museums was Phaedra Livingstone, professor of Museum Studies at the University of Oregon, Sheetal Prajapati from the Education Department at MoMA, and Harrell Fletcher, Director of the Art & Social Practice MFA program at Portland State University – the program that organized the Assembly event. On the team arguing for social practice to resist incorporation and remain OUTside of museums was Amy Harwood, co-founder of the outdoor artist residency Signal Fire, Deborah Fisher, executive director of A Blade of Grass, an organization focused on supporting socially engaged art, and Paul Ramirez Jonas, an artist who has worked within the field of social practice both inside and outside of museums. The debate teams were invited to set the stage by having each member make a position statement, and the audience was invited to respond to these stances with their own comments and questions. These were followed by a period of dialogue, first between the debate team members and then opening up to a free flow between audience and panelists. The IN museum side pointed out that there has been a long history of parallel development towards public engagement practices within museum education departments that naturally correspond with social practice art. They acknowledged that there are real reasons why museums are perceived as elitist spaces but argued that this could be changed faster by artists and museum practitioners working together from inside the institution to make more inclusive institutional practices and to more fully live up to their ideals as a public space and a public good. The IN side also pointed out that within the existing art economy museums are more compatible financial backers of social practice art than the existing commercial gallery world, where salability is paramount. The OUTside brought up strong concerns about the price of compromising the work by fitting it into museum sanctioned forms where it no longer has the wildness that gives it power. They astutely pointed out that museums are physically and financially structured around the collection and display of objects, and that unless that changes, social practice will always be at a disadvantage negotiating for recognition within those institutional structures. They also strategically made a call to refuse working with museums unless museums do more to present this work in the context of art discourse, as opposed to education and outreach, on the grounds that museums have more to gain from social practice work’s ability to generate their own audiences than these artists have to gain from getting access to the preestablished art audiences that come with a museum. The atmosphere was intentionally rowdy. Time was kept by the electric guitar virtuoso, LKN, who drowned out speakers with screamingly beautiful heavy metal riffs regardless of whether they were well credentialed or unknown. For the first half of the debate people were not allowed to respond directly to each other and instead could only voice their own questions and statements, which accelerated the flow of ideas but heated up the room with frustration. Speakers, both on the stage and on the floor, were rewarded with shots of mezcal for sharing their thoughts. The rules of the debate were changed on the fly mid-way through to make more time for discussion between the audience and the debaters. For the most part each person was only called upon to speak once, allowing as many different voices to be heard as possible and making sure no-one dominated the floor. By the end, much of the audience had joined the debate, and yet the room was still filled with an urgency to articulate all the perspectives that had not been expressed. As with a more traditional oxford debates, the audience was asked to vote before and after the discussion to indicate how persuasive each side was in making their case. While there was a slight movement from OUT towards IN throughout the course of the night, the final vote was a tie, resisting the charged desire to resolve the conflict, and instead re-emphasizing the importance of laying bare the different stakes in the field. I edited down the transcripts and wrote them up as an article for the Walker Art Center’s blog.